When the 1881 census was taken on April 3rd, the total population of England, Wales and Scotland was recorded as 29,707,207. The First Boer War ended only weeks before the 1881 census. As with any historical research, the golden rule of family history is to check the original record, or "primary source", wherever possible. We have provided clear images of the original census enumeration books for you to view once you've found the right family in the indexes. 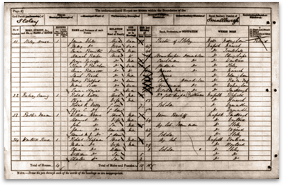 When using census returns, once you have located your ancestor in the census, you should then view the original images to validate your findings. The image of the original document will also help you see the household in the context of surrounding households as all the information will be provided in one clear place, as it was originally written down. The original documents would have been given to your ancestor several days before 3 April, and the head of household would have been asked to fill in the details for anyone who would have been residing at that address on the census date. If the head of the household was unable to read or write, the enumerator - a literate person who would be collecting the census forms - would help fill in the details. Because of this, however, you may note mistakes that were made, such as name spellings. It should also be noted that many people were often economical with the truth when it came to their ages. Note: the census includes details of people resident in docked vessels and institutions such as prisons, workhouses, hospitals, and barracks, as well as individual households.